Clinical prediction rules (CPRs) are certain signs and symptoms that can be combined to help clinicians narrow down the likelihood of a specific diagnosis or classification so that appropriate treatment may be directed to facilitate a timely and effective outcome. 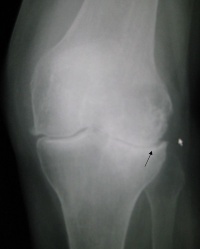 Currier et al  presented a level IV study in 2007 that favors at least a short term decrease in pain in people that have knee osteoarthritis after they undergone 4 different hip mobilizations. Hip Distraction- The patient is lying in supine. The intended lower extremity is grasped by the examiner above the ankle and put in ~30 degrees of hip flexion and 20 degrees of hip abduction. A traction force is then applied inferiorly to the point of resistance. 1. Caudal Glides- The patient is supine. The affected hip is flexed past 90 degrees until resistance is felt. A mobilization belt is place around the patient's proximal thigh and fastened down around the therapist's gluteal region. The therapist gives a counter force with his hands behind the patient's knees while he sits back into the mobilzation belt, giving the patient a caudally directed force through the hip joint. 2. Anterior-Posterior Glides- The patient is supine. The affected lower extremity is put into the FADIR position with the foot on the affected side placed on the lateral side of the other knee. A posterior force through the hip is imparted through the long axis of the femur by the therapist. 3. Posterior-Anterior Glides- The patient is prone. The affected hip is pulled into extension with the knee flexed with one hand by the therapist. The other hand provides an anterior force through the proximal femur at approximately the gluteal fold. The amount of hip internal or external rotation can be varied according to the point of most restriction. 4. Posterior-anterior Glides in the FABER position- The patient is prone.The affected lower extremity is put into the FABER position with the affected foot resting on the back of the opposite knee. An anterior force is applied through the proximal femur at approximately the gluteal fold. A pillow may be needed at the patient's abdomen or between the affected foot and the opposite leg for comfort. An important thing to keep in mind with this particular clinical prediction rule is that the results were seen very short-term. Effect size of almost any intervention will be significant in the short-term.. It is important to keep the results of this Level IV evidence study within that perspective. These 4 hip mobilizations have shown to provide short-term benefit with patients that present with knee pain from osteoarthritis and at least 1 of the above named variables. This is in the first step of a 3 step process that is recommended when formulating a CPR- CPR development. The next two steps need to be completed to apply this CPR with great confidence. These are: 1. completing a validation study and then 2. completing an impact analysis which would assess whether clinicians and patients benefit from the CPR. Childs JD, Cleland JA. Development and Application of Clinical Prediction Rules to Improve Clinical Decision Making in Physical Therapist Practice. Physical Therapy 2006; 122-131. Jaeschke R, Guyatt G, Sackett D. User's Guide to the Medical Literature III. How to use an article about a diagnostic test. B. What are the results and will they help me in caring for my patients? The Evidence-Based Medicine Working Group. JAMA 1994; 271:703-707. Randolph et al, cited in: Beattie P and Nelson R. Clinical prediction rules--what are they and what do they tell us? Australian J of Physiotherapy 2006;52:157-163. Military Service and Decision Quality in the Management of Knee Osteoarthritis. ↑ 1.0 1.1 1.2 Currier L, Froehlich P, Carow S, McAndrew R, Cliborne A, Boyles R, Mansfield L, Wainner R. Development of a Clinical Prediction Rule to Identify Patients with Knee OA and Clinical Evidence of Knee Osteoarthritis Who Demonstrate a Favorable Short-term Response to Hip Mobilization. Physical Therapy 2007; 1106-1119.